Galagos and bushbabies are African primates are small, quick animals that are still relatively common in many areas. They have long hindlegs (noticeably longer than their forelimbs) and a long tail. Their bodies are lightly built compared to the heavier lorisids. The ears are large and mobile. They have terminal disk-pads, and the pollux (thumb) is not opposable. 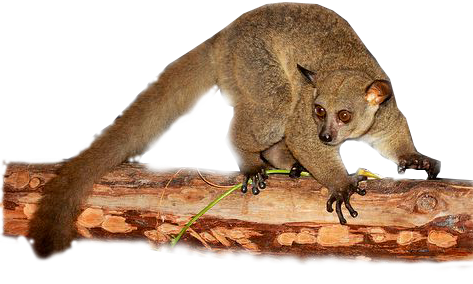 As in most other strepsirhines, their hind feet include a modified ” toilet claw.” Galagos move rapidly through the trees, leaping from branch to branch (up to 12 meters!). The smallest member of this family weighs only around 60 g, while the largest may weigh up to 1.2 kg. Their fur is soft and woolly, darker on the dorsal surface than the ventral, and ranging from gray to brown.